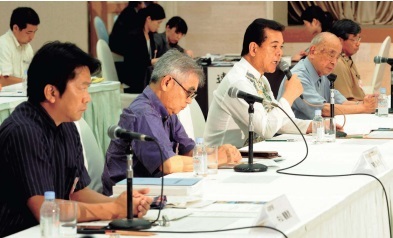 At a hearing on July 6 at the Pacific Hotel Okinawa in Naha, five witnesses chosen by each of Japan’s major political parties testified before the House of Representatives Peace and Security Legislation Special Committee. The committee deliberates on national security bills allowing a reinterpretation of Japan’s Constitution that enables the country to play a greater role not only in its own defense, but also in global security. Opposing the legislation were Nago mayor Susumu Inamine and former Ryukyu Shimpo president Tomokazu Takamine, chosen by the Democratic Party of Japan and the Japan Communist Party. Favoring the legislation were Minamigusuku mayor Kageharu Koja and Ishigaki mayor Yoshitaka Nakayama, chosen by the Liberal Democratic and Komeito parties. Former Okinawa governor Masahide Ota, the witness chosen by the Japan Innovation Party, expressed his opposition to the construction of a new military base in Henoko, Nago, while opposing the change to the constitution. Even the two proponents of the legislation called for cautious deliberation, with Mayor Nakayama saying he did not think that Japanese citizens’ understanding of the bills had deepened, and Mayor Koja recommending that a thorough explanation be given to achieve the people’s understanding. Japan’s ruling party, the LDP, says it plans to have the committee vote on the legislation as early as next week, but the call for cautious deliberation from the witnesses chosen by the LDP will likely have an impact on the committee’s schedule. Mayor Inamine said that the legislation is in violation of Article 9 of the Japanese constitution, and that passing it would violate the fundamental principle of constitutionalism, since it would be tantamount to a de facto amendment to the constitution. He further stated that the government and the LDP’s attempts to pass this legislation without the full understanding of the Japanese people stems from the same core problem as their persistence in moving forward with the construction of the new base in Henoko despite widespread Okinawan resistance. Takamine also compared the security legislation to the Henoko base construction, saying that they comprise the Abe administration’s two key promises to the United States. He expressed his opposition to both the legislation and the base construction. Ota emphasized his refusal to accept the construction of any new bases or the reinforcement of base functions, stating that the Okinawan people’s opposition to the bases is grounded in their experiences of the Battle of Okinawa. He stressed the need for debate based on an understanding of the history of the Battle of Okinawa. Mayor Koja, meanwhile, explained his decision to support the right to collective self-defense, stating that it only authorizes the use of force with the aim of defending national security. Furthermore, regarding common misunderstandings toward Okinawa, he asked that people do more to deepen their understanding of Okinawa’s history. Mayor Nakayama expressed a deep sense of concern regarding the crisis of the incursion of Chinese government vessels into the waters surrounding the Senkaku Islands, and praised the legislation, saying it would ensure Japan’s peace and security by allowing cooperation between the Japan Self-Defense Forces and the U.S. military. The recent issue of LDP members calling for suppression of the media also came up at the hearing, and all witnesses expressed displeasure with comments toward Okinawa made at the LDP meeting, calling them unfounded and incorrect.